Had you heard about the absolute disaster that revolved around the 2010 Adidas Jabulani soccer ball, used in that year's World Cup? Yeah, me either. But professionals used words like terrible, disaster, and catastrophe to describe its performance. How has Adidas changed the ball for this year's Cup? It's futbol season! The 2014 World Cup is finally upon us, and pretty much the only time that most of us in America give any attention to soccer. Even now, the sport still doesn't get the attention and respect it deserves. We should all acknowledge that the MLB, NBA and NFL's annual declaration of their "World Champions" is a complete crock, when American teams aren't competing against others from around the world. Okay, rant over. The 2010 Jabulani ball was despised because the ball had a tendency to "knuckle" or to fly with little to no spin, like a knuckleball. This made the ball's flight unpredictable, much to the horror of goalkeepers. The video above shows the "Jabulani Effect" in action. 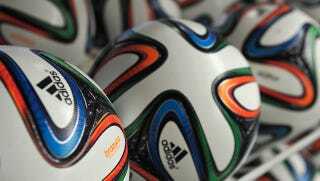 What's new about the 2014 ball, the Brazuca? Adidas increased the seem length and depth on this ball, and also added thousands of tiny bumps to its surface. The bumps create a boundary layer of air while the ball is in flight, thereby reducing drag behind it. The roughness of the surface will actually help increase the amount of spin on the ball. NASA tested the aerodynamics of the new ball in their wind and water tunnels at their Ames Research Center. "Sports provide a great opportunity to introduce the next generation of researchers to our field of aerodynamics by showing them something they can relate to," said Rabi Mehta, chief of the Experimental Aero-Physics Branch in Moffett Field, California. "The players should be happier with the new ball," predicted Mehta. "It is more stable in flight and will handle more like a traditional 32-panel ball." While I'm at it, Adidas should get into naming cars. Jabulani and Brazuca sound like names you'd see on Italian sports cars, don't you think?